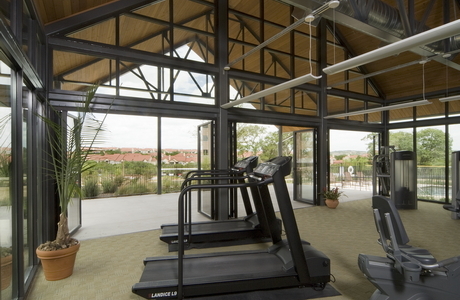 Just west of downtown Austin, the retirement community, Querencia at Barton Creek, strives to provide more than a mere “retirement lifestyle.” Rather, the facility promotes a complete program and methodology called Masterpiece Living that opens retirees’ lives to enjoying increased self-awareness, purpose, social interaction and physical and mental conditioning. Essential to the Querencia experience is the facility, designed by D2 Architecture. 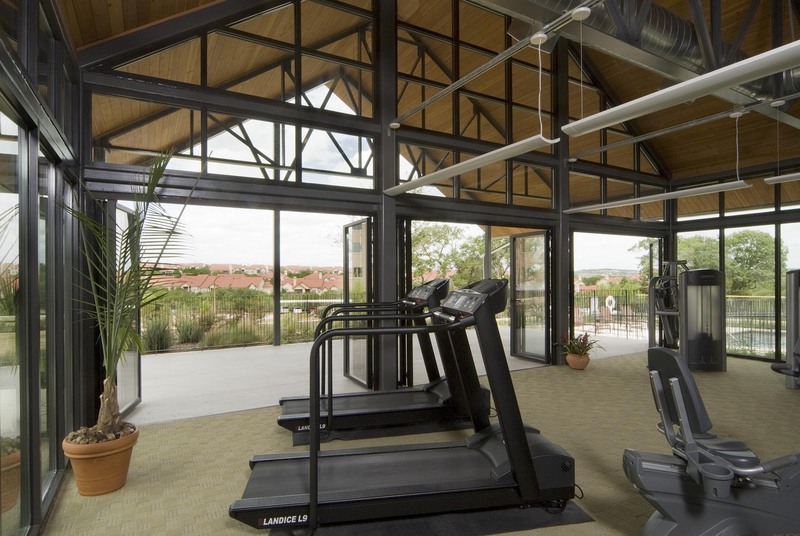 David Dillard, principal at D2, says there is a “cultural marriage between natural world and Austin.” The NanaWall installation in the Fitness and Wellness Center and Art Studio not only enhances but symbolizes this marriage. 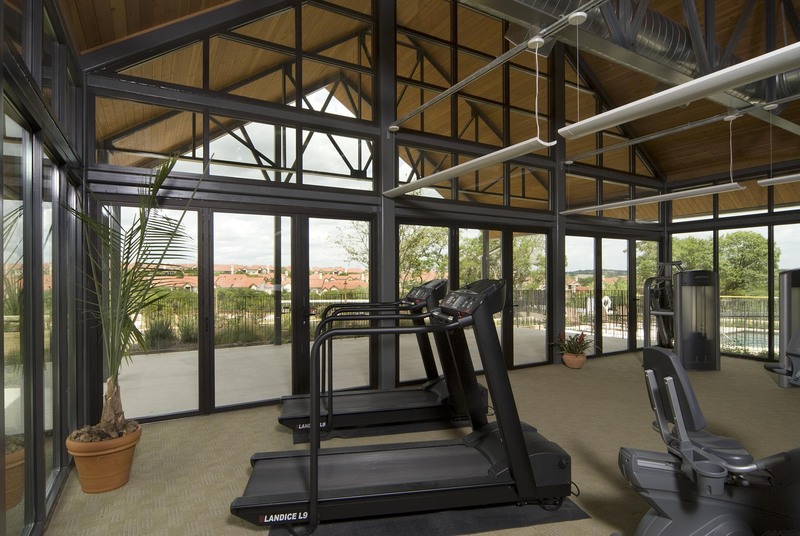 With the opening glass wall, Dillard realized a solution of integrating the beauty of the hill country into the fitness center. 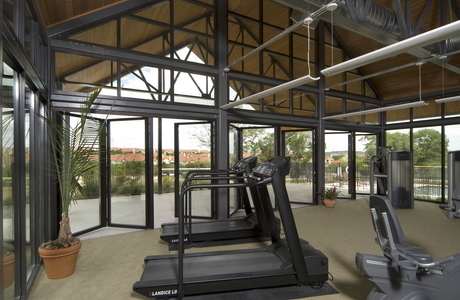 “A NanaWall system was the only way that I could imagine a functional and aesthetic solution at Querencia — an opening wall that turns the fitness center into an outdoor pavilion in a matter of seconds,” says Dillard. D2 Architecture specified a black anodized finish for the nine panels, which were separated into three sections. The finish complements the exposed steel in the framing and truss. Each section offers a door – acting independently of the other panels – that opens up to the expansive patio. 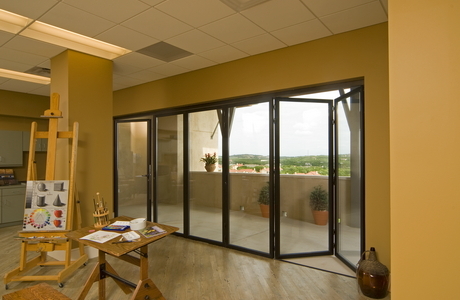 This operable glass wall design proved a perfect choice for the Texas climate, providing insulation during the hot summer months, and transparency at all times. 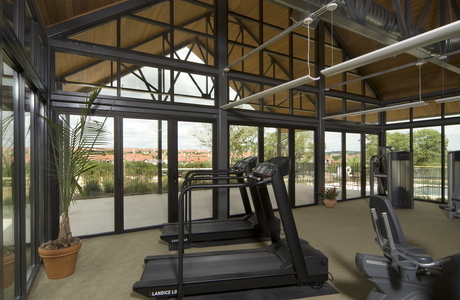 The fitness studio was designed to look like a Texas barn, which, combined with NanaWall's transparency and full retractability, helped Dillard to achieve his goal: A design that “blurs the lines between the outside and inside worlds”. 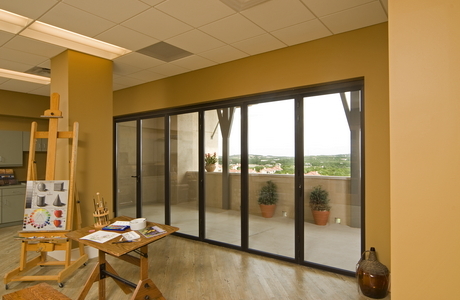 The NanaWall system design for the art studio is made up of six SL45 Aluminum Framed Folding System. 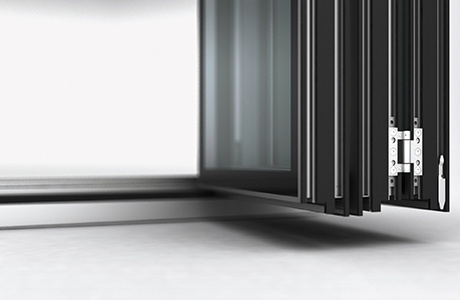 Each glass panel is framed with a black anodized finish. 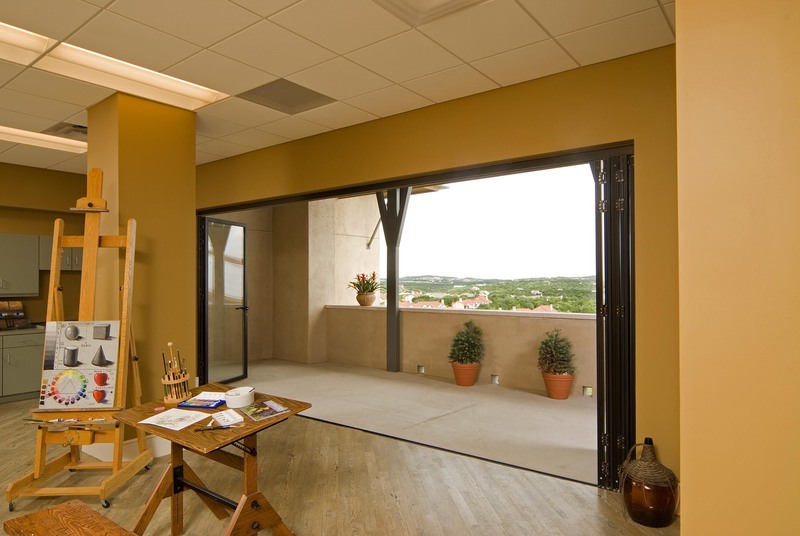 The top-hung system is perfect for the art-studio, as floor tracks would be cumbersome for any artists moving their project to the terrace. Dillard has used NanaWall products because of their outstanding publicity, longstanding durability and extensive use in the architectural community. Querencia is a Spanish word that is often translated to mean a safe place where one can achieve his or her authentic self. 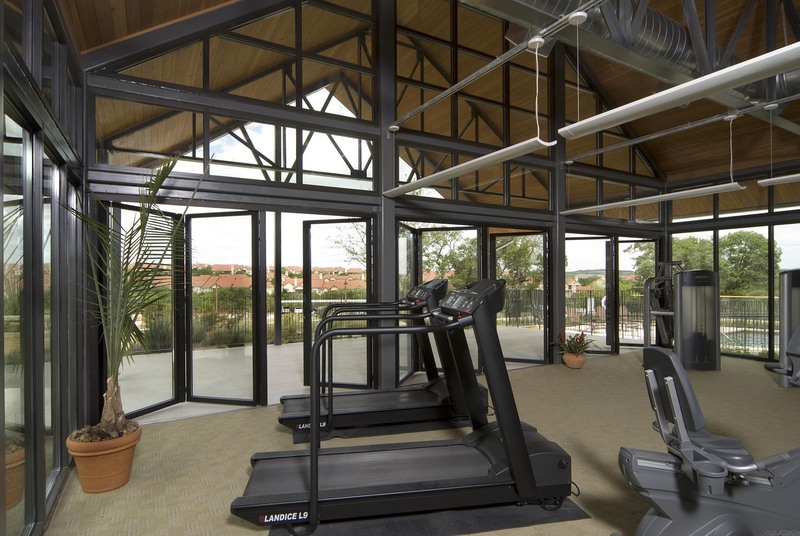 This is a perfect world for this retirement community, and NanaWall's product has helped maintain the Austin way of life for Querencia residents, whether they are walking on a treadmill or painting the horizon of the Texas hill country. "The durable metal clad exterior and high-quality hardware of the NanaWall system are able to stand up to our weather and everyday use of the door, while providing a seamless connection of space and expansive mountain views."